For women living in Dubai, lifestyles are a unique blend of most the modern resources within a very traditional and patriarchal social inclination. It becomes very difficult to participate in an active lifestyle when many of the places have restricted access; or very strict rules regarding clothing that aren’t very comfortable. For many women seeking a cosmopolitan lifestyle, it is best to have a personal trainer from Dubai at home rather than visit a public gym. However, finding the right trainer to attend to your needs may be more difficult that one would imagine. There are very few training centers with exclusive facilities for women; and even when you find such a gym, there is a matter of individual attention. Even if a lady does find a gym exclusively for women, there is the matter of what services you are availing to. A professional lady personal trainer in Dubai would be able to guide you through each exercise till you perfect the movement, help you follow a nutrition plan, and also be able to help you with pain and injury management. That takes a lot more study and experience than just helping with the weights! (a) Some Facts about Equipment: It’s not necessary to buy weights and a multi gym set for maintaining a healthy regime, though a simple multi-gym kit isn’t very expensive or cumbersome. It is more important to have a quiet and secluded room; with limited access, but ample ventilation. The floor should be well matted with special flooring materials which are commonly available; and it would be good to have a humidity regulator along with your air conditioner. Other equipments are easy to come by online, like yoga balls, medicine balls, basic free weights, skipping ropes, and such simple exercise paraphernalia. However, when exercising at home, it is better to use equipments minimally and rely more upon movement and aerobics. (b) Choosing a Personalized Routine: One of the biggest benefits of having a dedicated personal trainer in Dubai at home is being able to choose your own kind of exercise pattern. Some people like to train with the use of weights and equipment, while others suit better to using only calisthenics and movement based exercises. By hiring a professional trainer to attend to you personally, you can ask them to set you an effective lifestyle routine that you can easily adjust too. Since the trainer gives you individual attention during the session, your choice of exercises, frequency of sessions, and lifestyle changes are much better coordinated. (c) Individual Trainers and Training Studios: Since physical training is common enough, there are plenty of experienced fitness experts offering training sessions online. However, there is a limit to how many clients a single trainer would be able to attend to. 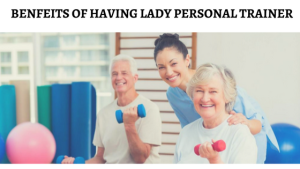 Always look for a lady personal trainer in Dubai from a larger fitness studio where several fitness professionals combine their knowledge and resources. In this way, an absent trainer would be instantly replaced by an equally adept professional, and you would not have to skip on your routine. Also, a fitness studio would have their own training studio facility, which would be at your disposal for specific kind of training with special equipment from time to time.